This week Judith Plaskow and I submitted the final version of our new book Goddess and God in the World to our publisher at Fortress Press. Just before completion, I added a shorter version of the following passage to my final chapter. In it I tried to describe the odd feeling of not being moved any longer by a religion that once moved me profoundly. Our book, which explores an embodied theological method, will be out in the summer of 2016. I have never regretted my decision to leave Christianity. Although I have a sentimental attachment to Christmas trees, Christmas dinners, Christmas carols, and some hymns, I miss little else about Christianity. At a distance of several decades, I find that I quite simply have no feeling for the Christian edifice of doctrines and rituals based on the life and death of a single individual. Jesus was a visionary, but there have been many others like him—including Martin Luther King, Elizabeth Cady Stanton, and Gandhi, all of them flawed, as Jesus must have been as well. A few years ago, I decided to participate in the Greek Orthodox Easter week services, because they are attended by so many of my neighbors. But while enjoying the company of the women who decorated the epitaphios (tomb for Jesus), the procession through the streets of our town on Friday night, and the lighting of candles at midnight on Saturday, I came to a clear understanding that the Easter drama is no longer my drama. During the Thursday night services, I realized that many of the women were openly grieving the death of Jesus. Though intellectually I could understand that the Easter drama allowed my friends to release pent-up and repressed feelings, I found their deeply emotional response to the re-enactment of the death of Jesus bizarre. In leaving Christianity, I had gained the freedom to name the sacred in my own experience, confirmed my deep inner knowing about the human connection to nature, and found the power to create and participate in rituals that have meaning in my life. For me now, the rituals on the Goddess Pilgrimage to Crete are at the center of my spiritual life. To listen to Alice Walker’s words, “We have a beautiful/mother/Her green lap/immense/Her brown embrace/eternal/Her blue body/everything we know”* on a mountaintop or to repeat Ntozake Shange’s cry, “we need a god who bleeds now/whose wounds are not the end of anything”** at the mouth of a cave, moves me more than any passage from the Bible. *Alice Walker, “We Have a Beautiful Mother,” Her Blue Body Everything We Know: Earthling Poems 1965-1990 (New York City and Orlando, FL: Harcourt Books, 1991), 459-460. **Ntozake Shange, “we need a god who bleeds now,” A Daughter’s Geography (New York: St. Martin’s, 1983), 51. ***See Carol P. Christ, She Who Changes: Re-imagining God in the World (New York: Palgrave Macmillian, 2003), 238, for a discussion of the meaning of the new words. Carol P. Christ leads the life-transforming Goddess Pilgrimage to Crete (facebook and twitter). Carol’s books include She Who Changes and and Rebirth of the Goddess; with Judith Plaskow, the widely-used anthologies Womanspirit Rising and Weaving the Visions and forthcoming in 2016 from Fortress Press, Goddess and God in the World: Conversations in Embodied Theology. Explore Carol’s writing. Photo of Carol by Maureen Murphy. 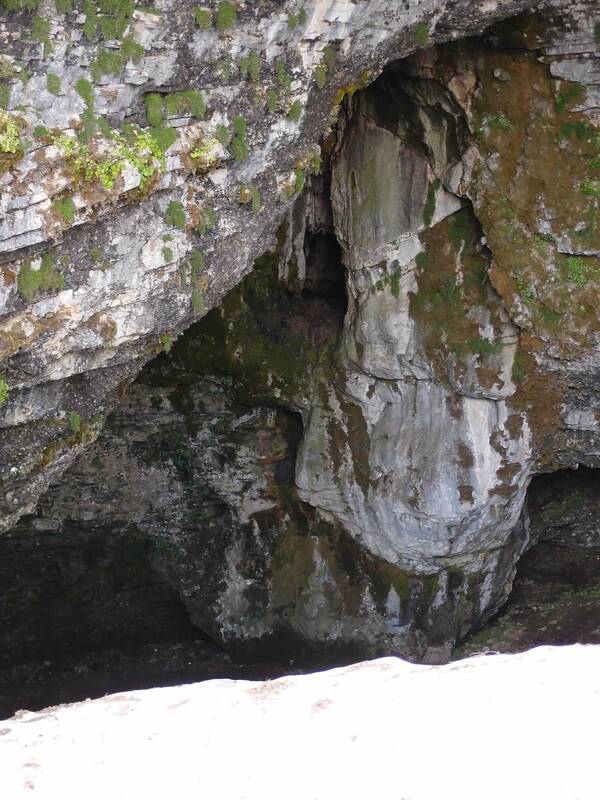 Photo of Idean Cave by PJ Livingstone. Well said, Carol. Find your statement, “I came to a clear understanding that the Easter drama is no longer my drama” especially poignant. My experience has been similar. Why a particular (religious) story is meaningful to some people does fascinate me, though, and I always find myself curious just how and why people connect to the mythology they “believe in.” I look forward to the new book coming out in 2016. Thank you for these recommendations of the Tao Te Ching by Le Guin and Chen … I’ve added them to my wish list as there’s just something about the Tao … no matter how many times I read it or the various translations, I’m touched at a different level. I can relate. Although I often feel sad that it took me 20 years to get here. May our daughters, nieces and granddaughters recover more quickly – or, better yet, never need to! As a priest’s daughter, I grew up with the Easter drama as central. I felt compelled to re-tell the story from the point of view of a/the goddess. Now everything is changed. The story before during and for two volumes after is hers. I’m eager to read your new book. I’m with you that Christian symbols no longer resonate in me. Some years ago, I edited two books by a Dutch Calvinist theologian who lives in (I think) Malaysia. He said that we can only find “salvation” in the blood of the cross of the crucified Jesus. Yuck! It’s fine for people to believe that, but I sure don’t. I agree with Shange about the monthly blood that is not a wound. The symbols, in fact, of none of the standard-brand religions move me. It’s the Goddess in her 10,000 manifestations that move me. Congratulations! on finishing your book with Judith Plaskow! And snow at the cave, how amazing. yes there was a lot of snow last winter and it was still in the cave in June! This happened once before in the past 20 years. We had a wonderful time with the birds at the cave mouth who began singing with us. Lovely reflection on why you left Christianity. Thank you for the poetry and the new lyrics for the doxology. Thank you Carol. At the funeral of my best friend, a recovered Catholic (funeral mass courtesy of her family), I read aloud Alice Walker’s poem that begins, “We have a beautiful/mother/Her green lap/immense/Her brown embrace/eternal/Her blue body/everything we know”. These words, spoken within St. Mary’s Cathedral in Minneapolis (following priestly references to the “Lord,” “Son of Man,” etc and his declaration that we should rejoice that Molly was with “God the Father”–statements that would have had her fuming!) affirmed her conscious rejection of Catholic theology and her embrace of Goddess spirituality during her lifetime. And I was not struck dead for reading Alice Walker’s words in that setting–it felt liberating! Thank you for suggesting and inventing language, places and rituals to replace the oppressive language, places and rituals associated with patriarchy. I am so pleased Martha that you did that and were able to do that. If Molly was there, she smiled. Beautiful – could not agree more.. Thanks for sharing the words of Walker and Shange. I so hope to be able to visit Knossos again one day. Symbols of patriarchy not only not move me anymore (although I stay vigilant, because patriarchy is very alienating), but irritate me because they justified so much harm to women, gave men free highways to abuse women, and masked culpability with even proudness. I’m starving of new symbols. As a gay man I wholeheartedly resonate with the sentiments expressed. The freedom of worshipping the Goddess is leadinģ me to a wholeness and balance that is deeply healing.